Dusty can eat it up, sweep it up, and dump it out! Real working Dusty the Super Duper Garbage Truck includes Lights and sounds, and can help pick up your toys! With exhaust vacuum Motorized Garbage truck functions. Dusty says 50 fun sounds & Phrases. Press button on handle to open mouth. Motorized Mouth moves forward and back. Just lift up the back bin to dump out the toys. 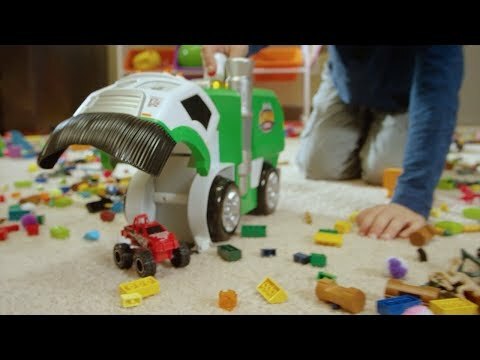 Stretch out the side exhaust pipe to vacuum up your toys. Both, front bottom and side brooms spin when the handle button is pressed. "Help me to find the red shoe"
Includes: -1 Garbage Truck -1 Blue Fish bone -1 Red Shoe -1 Black Tire -1 Silver Garbage Can. 4 - AA batteries required(included). Designed for kids ages 3+.